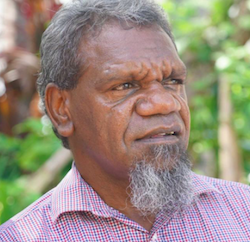 The Mparntwe traditional owner family group, who rejected the Anzac precinct as a culturally appropriate site the National Aboriginal Art gallery, are declining to attend a meeting with the Town Council on Tuesday. They say their position was made clear in their letter to council dated 9 January 2019. The first signature on that letter was that of Benedict Stevens (left, ABC photo), who had previously been the only named custodian to support the Anzac Precinct as the government’s preferred site for the gallery. His is also the first signature on a further letter today, a copy of which was made available to Alice Springs News Online. The letter reiterates that the family group “fully support” the National Aboriginal Art gallery being built in Alice Springs “at a culturally appropriate site that does not include Anzac Oval as part of the overall site”. They thank council for the invitation to attend their end-of-month meeting, but “the family group believes our position has been made clear and do not see the need to attend the formal meeting of Council on 29th of January to provide further clarification”. Right: Custodians Doris Stuart and Peter Renehan at Watch This Space gallery. Photo from our archive. They provide an email contact and close by saying they “look forward to working with Council in the future for the betterment of our Town and community”. The other signatories “on behalf of the custodial family group signatories” are Doris Stuart and Peter Renehan. @ NW: I do not want a National Indigenous Art Gallery, but a national Aboriginal cultural centre. Culture includes art but art does not include culture. After 150+ years of colonisation in Mparntwe the Arrernte custodians are still here and still working to protect their country an culture. This shows enormous resilience. Now they’ve come together as a group an made a public statement regarding a certain Indigenous cultural development on their land. Wow. If the council can recognise and give them the respect they deserve as senior custodians, Apmereke-artweye and Kwetungurle, and support them in their wish that the development not happen at the Anzac precinct, it would be a great act of reconciliation and perhaps show the way towards how we should and what we could all celebrate on Australia Day. Peter: The so called “racist” mob are trying to build an National Aboriginal Art Gallery to celebrate our awesome Indigenous cultures. Doesn’t sound like something racist people would do, just because they have made some questionable and silly mistakes in the initial process hardly makes them all “racist”. People need to stop using the word racist just because they can’t think of anything else or when they are losing an argument. Anyway, the NT Government has no money and the Alice Springs Council can’t do it alone so, moving on. I agree with Domenico Pecorari’s statement, especially in relation to Mayor Ryan. 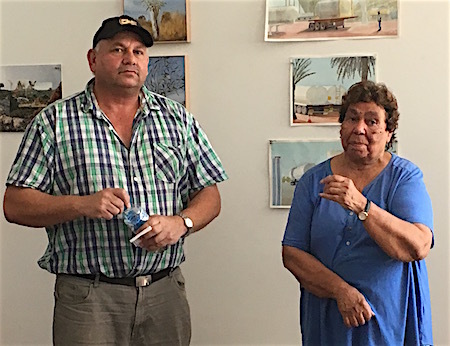 Since he first became Mayor of Alice Springs, Damien Ryan has been seen to establish and maintain a good and respectful relationship with the town’s Indigenous residents. The question now is, will he jeopardise that relationship, and jeopardise his legacy, by going against the clearly stated wishes of what can only be seen as an unfortunately uncommon unanimity of opinion and desire clearly expressed by this group of local elders and traditional owners? And for what? Chief Minister Gunner does not live here and is clearly working to his own agenda. Mayor Ryan does live here and will have no excuse if he chooses to follow CM Gunner down a road of disregard and disrespect. Everyone wants a National Indigenous Art Gallery to be built in Alice Springs. The Anzac Precinct is not the only option. If CM Gunner cannot see that then the whole project looks like foundering on the rock of his intransigent hubris. It’s not happening, no one has any money. Move on please. This much talked about NAAG is slipping away, like water that the NT Gov tried in vain to keep in their cupped hands… and Alice will lose out. Good job! Thats what they get for trying to play (Aboriginal) people against each other. All their underhanded and dishonest tactics backfired on them. Whilst trying to divide (Aboriginal) people, they have succeeded (unwittingly) to unite people and TOs.